Inventory We are a resale marketplace, not a box office or venue. Ticket prices may exceed face value. This site is not owned by NRG Stadium . NRG Stadium, formerly Reliant Stadium, opened August 24, 2002 on One Reliant Park in Houston, Texas. The Reliant Stadium box office boasts a seating capacity of 71,500 and was built for a total construction cost of $352 million. 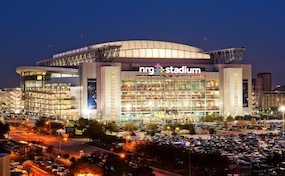 NRG Stadium is currently the Home of the National Football League's Houston Texans, the Texas Bowl, and the Houston Livestock Show and Rodeo. NRG Stadium tickets have included many different USA National Soccer events, Super Bowl XXXVII, Wrestlemania XXV, NCAA Men's Basketball Tournament, MLS All-Star Game, and the Texas Bowl. NRG Stadium has also hosted some famous performers like the Rolling Stones, Miley Cyrus, U2, Metallica, and more. StadiumHouston.com is not affiliated with any primary box office or venue. We are a privately owned and operated company that provides access to a large selection and low prices of secondary market inventory online. To purchase tickets for any NRG Stadium events simply click on the desired date or call our operators at anytime to guide you through the process.